Angelina Jolie has honored Pakistani schoolgirl activist Malala Yousafzai, who has launched Malala Fund, a charity to fund girls’ education. 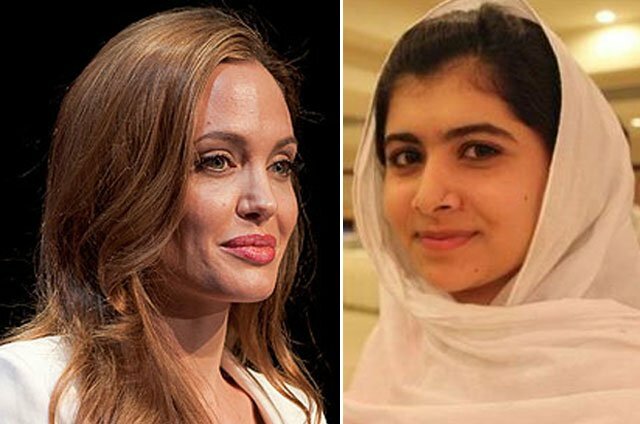 In New York, Angelina Jolie said Malala Yousafzai would be “in charge” of the Malala Fund. Malala Yousafzai, 15, said in a video the launch was “the happiest moment of my life”. The charity’s first grant will fund the education of 40 girls in Pakistan. Malala Yousafzai was shot in the head by the Taliban in October in retribution for her advocacy for girls’ education. The teenager now attends school in Birmingham, UK, following her recovery from the shooting and has signed a book deal worth about $3 million for her memoir. The book, titled I am Malala, is scheduled for publication in the autumn. “Announcing the first grant of the Malala Fund is the happiest moment in my life,” Malala Yousafzai said in a video message at the Women in the World conference in New York. Malala Yousafzai started school again in mid-March following surgery to fit a titanium plate and cochlear implant into her skull.